Tackling an entire festival's line-up is, of course, a heavy and almost impossible task. 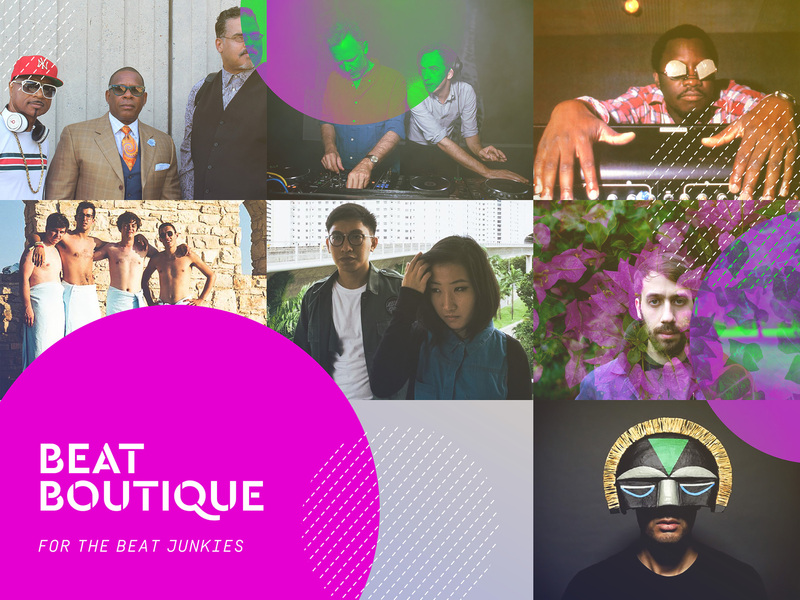 Unlike a regular concert, it's perfectly normal to jump between different sets like a music tourist, and perhaps explore some of the art-centric installations. With set clashes and time management and all that, the most important goal in surviving a festival is to conserve energy — and also keep track of when your favourite act is performing. But what if you're also going to Neon Lights Festival to explore music you haven't heard of? 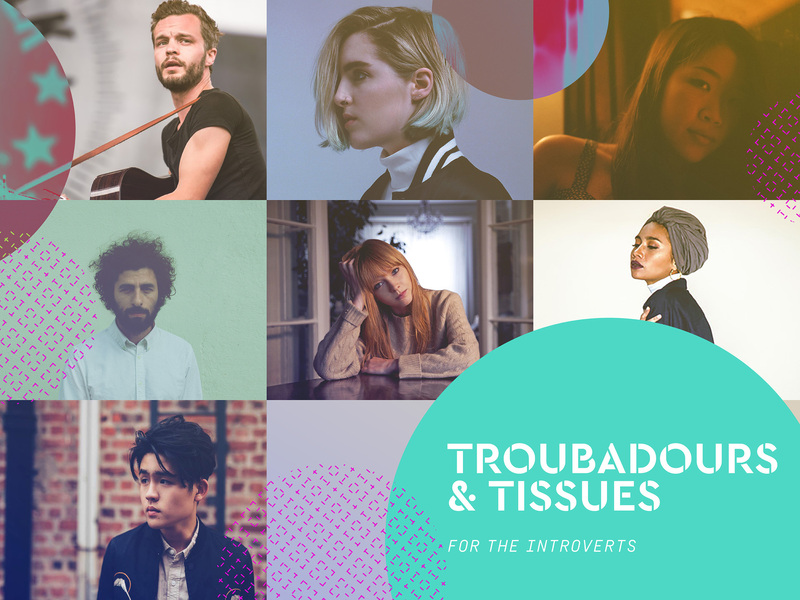 We figured this might be the case for many festival-goers prepping for next weekend, so instead of simply breaking down each act involved, here's a personality test to gauge which acts you'd enjoy the most on November 26th and 27th. 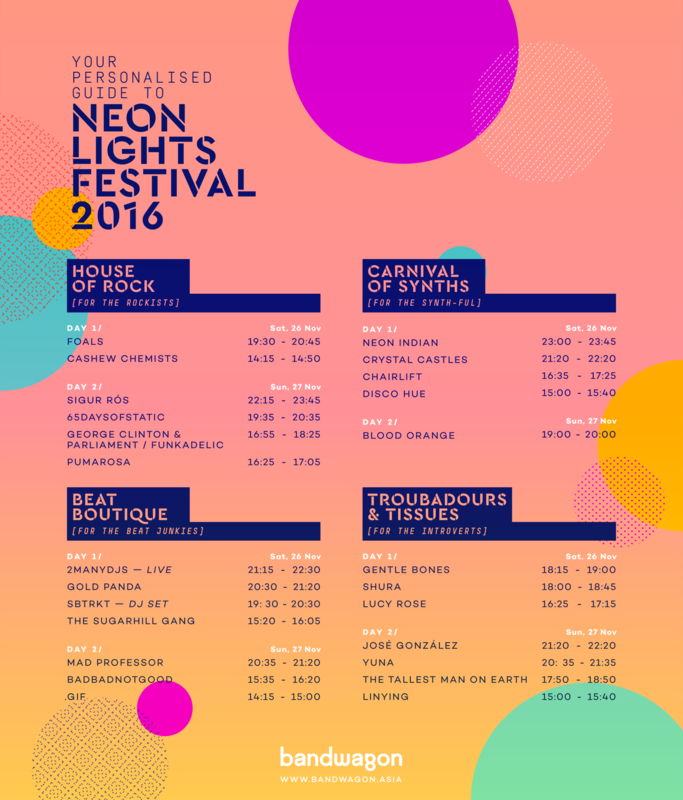 We've separated the acts on Neon Lights into four concise imaginary festival stages for each personality result: the House of Rock, Carnival of Synths, the Beat Boutique, and Troubadours & Tissues. 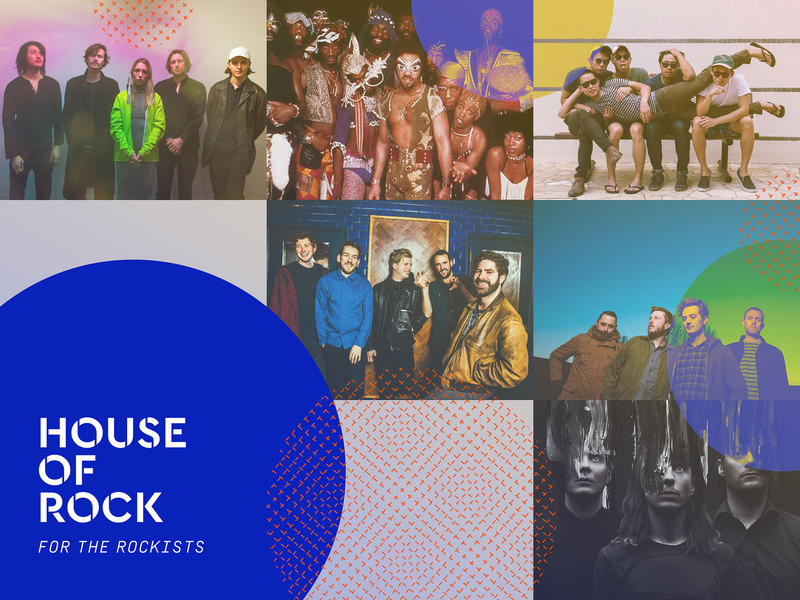 From there, get the low down on each act and why you should watch them, a sample of their best work, and when you can watch them. Fronted by former dancer and theatre designer Isabel Munoz-Newsome, Pumarosa is a newer band destined for big things. Their propulsive brand of spiritual electro-rock could easily the sleeper hit of Neon Lights this year. Active as a combined unit for over six years now, you'd be hard-pressed to find an artist with the stature and influence George Clinton still going strong now. As the founder of the P-funk movement, Clinton was a pioneer in fusing electro, psych rock, and funk, as well a major influence in R&B and hip-hop. 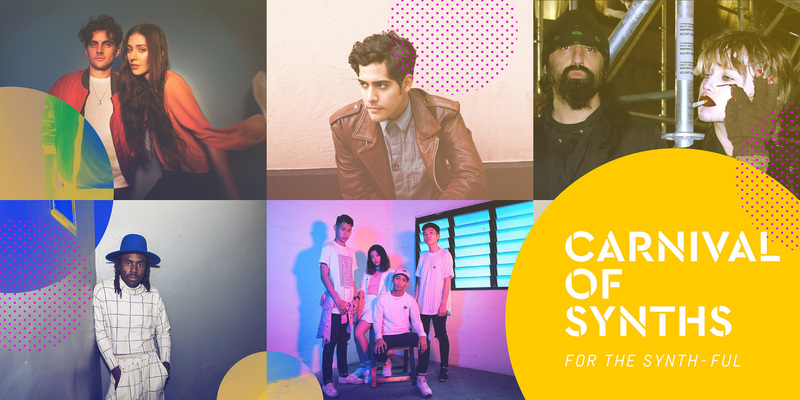 Catchy and exuberant, few bands in Singapore are as instantly loveable Singaporean indie band Cashew Chemists. No strangers to big festival stages, these guys are good old rock ‘n’ roll with a healthy dose of blues and psychedelic rock thrown in for good measure. These English indie darlings are best known for their poppy, jittery and upbeat sound. With songwriting incorporating everything from post-punk to new wave, Foals make rock music that you can definitely dance to. 65daysofstatic are an enigmatic post-rock outfit that’s as influenced by math instrumentalists as they are by electronic genres such as drum & bass, techno and glitch. Cerebral and sprawling, sounds like the soundtrack to your sci-fi fantasy. Experimental, dreamlike and overwhelmingly atmospheric - Sigur Rós are magical Icelandic creatures who happen to be in a band. If you’re looking for an act to sound like how the Northern Lights appears - this is the one for you. Heavy synths and folk melodies find their idyllic marriage in Chairlift. The duo’s brand of spacey rock and poppy indie aesthetic has proven itself to be immensely popular with Singaporean festival crowds in the past and Neon Lights should be no different. Back when chillwave ruled the roost, Neon Indian was certainly the genre’s banner act. Though his newer material has since departed from his roots to go in a funkier direction, Neon Indian’s brilliant songwriting is certainly no less sparkling or summery. Alice Glass may be gone, but Crystal Castles are still as provocative as ever. New vocalist Edith Frances is a more than capable replacement, and as their amazing new album Amnesty proves, Ethan Kahn’s driving beats and eerie atmospherics is still the unheralded star of the show. One of Singapore’s freshest synth-pop acts, Disco Hue has broken out in 2016 thanks to their insanely infectious singles and quirky music videos. Of all the local bands to have emerged this year, Disco Hue may be the one with the most substance behind them. Groovy and oh-so smooth, Blood Orange has grown from a cult favourite into a star thanks to his inspired blend of R&B and chillwave. The solo project of Test Icicles and Lightspeed Champion’s Devonte Hynes, Blood Orange promises to be a truly synth-ful affair. Rap has come a long way since the 70s’, and The Sugarhill Gang is the reason the genre broke out beyond New York City into the world at large. Scoring hip-hop’s first ever commercial hit in 1979 with ‘Rapper’s Delight’, the group’s music is at the core of hip-hop’s very foundations. Made up of Belgian brothers David and Stephen Dewaele, 2manyDJs is the crazier more carefree alter-ego of their Soulwax project. Best known for their wild mash-up sensibilities, look for the duo to fuse classic rockabilly with disco, hip-hop and new wave in inexplicable ways. Coming up under the tutelage of the legendary Lee "Scratch" Perry, Mad Professor is one of the foremost figures in the second generation of British dub. Combining reggae and electronic music, Mad Professor’s space age productions formed the blueprint for dub in the digital age. Walking the elegant line between swirling electronic textures and leftfield instrumental hip-hop, Gold Panda’s productions are distinctively mellow, cerebral and sophisticated. The British producer’s hypnotic live show engages the brain and the body. Emerging from London’s bass scene, SBTRKT made a name as one of the genre’s most forward-thinking producers. Combining 2-step, house, garage, soul and techno into a heady, percussive concoction, SBTRKT is something you’d definitely want to add into your itinerary. Moody, yearning and poetic, .gif’s narrative-driven music is compelling on a lyrical level and on a production level. Performing with a live band made up of Tim De Cotta on bass and Teo Jia Rong on drums, this looks to be an extra-dynamic set from the acclaimed indie-electronic duo. In theory, BBNG may be a jazz-fusion act, but in practice, the group’s hip-hop and bass music influence makes them a must-see for all beat junkies. Bridging the worlds of rap, electronic music and jazz, BBNG’s inventive instrumental compositions are incredibly thrilling. Touted as Sweden's indie Bob Dylan, The Tallest Man On Earth may not live up to his name in physical size, but the sheer depth and imagination of his lyricism and folk instrumentation will leave you in awe. A breakout act in 2016, Shura's poignant outlook has permeated her 80s-inspired work, resulting in a vibrant and thoughtful debut LP, Nothing's Real. Think of Madonna, but with more introspection and modernity. Linying's career trajectory has blossomed in 2016, but it also signals the start of something even bigger for the artist. Her appearance at Neon Lights Festival will undoubtedly be a performance worth catching, and you can count on her soaring and atmospheric songs to prosper on a big festival stage. Malaysia's Yuna has become a bonafide international star, with her recent album drawing guest features from Usher and Jhene Aiko. Even with her set at Neon Lights Festival being one of many local appearances, she'll be coming along prepared with fresh, engaging material that marries her classic intimate lyricism with velvety R&B production. Endearingly earnest and intelligent, Lucy Rose remains a delight in modern folk music. Her live performances are no different — with her effortless charm onstage and a dexterous live band, she's a must-see if you like your music buoyant and poetic. The popular singer-songwriter returns to Singapore after eight years, and his set is undoubtedly one of the most anticipated. His classically-inspired playing and imaginative lyricism are on full display on his latest album, Vestiges & Claws, and they will no doubt be a highlight through the entire weekend. Moving from his previous folk-pop sound to a darker, edgier approach, Singapore's Gentle Bones is now one of the country's most notable music acts. But make no mistake, despite selling out Esplanade Concert Hall two nights in a row, he still has a lot to prove at Neon Lights Festival, and his set will showcase his artistic ambitions tenfold.